The last decade saw big changes in terms of technologies used in the design of mattresses. In addition to the advances in the materials used in the construction of mattresses, various combinations of these materials are used to create hybrid mattresses that are emerging to be one of the most popular mattress design options on today’s market. Hybrid mattresses combine the benefits of traditional innerspring and foam mattresses while lessening the negative effects of both. Therefore, they offer a combination of foam comfort layers and coil foundation and create a very comfortable but supportive surface. 2″ Comfort Layer – This layer is 2″ of special gel memory foam designed to provide contouring support and motion isolation, ensure pressure relief, and reduce heat retaining. 2″ Support Layer – This layer provides responsive comfort and support for the body during sleep, and it is made up of 2″ of 1353 (in a queen) individual micro coils. 2″ Cooling Layer – This layer is 2″ of Airlux ventilated foam that allows the air to circulate freely through the mattress and creates a cooler and more comfortable sleeping environment. 8″ Support Layer – This layer is 8″ of Quantum Edge Combi-Zone individually wrapped coils that provide support for the mattress and deep compression support for the body during sleep. The entire layer is zoned to provide support to those regions of the body that need it most, and reinforced coils around the edge provide appropriate edge support for the mattress. As for the exterior, the Oceano mattress has a beautifully designed cover that is stretch-knit and made of highly breathable, soft and smooth, plant-based Tencel. This 4-way stretch cover is skin-friendly and hygienic. It keeps your carbon footprint minimal and allows you to experience the full benefits of the memory foam comfort layer. The soft Eurotop with tailored tweed sides, custom handles, and button-tufted upholstery add to the luxurious feel and appearance of this mattress. The Oceano scores 6 out of 10 for firmness, with 10 being the firmest. Heavier sleepers may press through the top comfort layers and feel a little on the softer side to them and more of the bouncier micro springs in the mattress. In terms of support, this mattress provides excellent support. 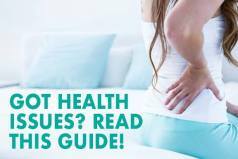 It provides enough give in the top comfort layer to support shoulders and hips while having enough firmness to support your back and stomach, which makes it suitable for all sleeping positions. The micro coil construction and gel memory foam layers provide a pretty high degree of bounce and responsiveness with the Oceano, and 14″ thick design provides a good support to heavier sleepers. The tufted soft Tencel cover of the Oceano makes a really comfortable sleeping surface, and the combination of the top comfort layer of gel memory foam and micro coil layer provides a very supple and comfortable top layer to the mattress. The foam and micro coil spring design provides a high level of responsiveness and a degree of bounce to the mattress which is ideal for late night couple’s amorous activities. This mattress does not retain heat due to its multiple layers of gel memory foam, micro coils, ventilated Airlux foam and Tencel top cover, so you won’t get the sticky sweaty feeling that some foam mattresses cause. The hybrid design of this mattress that allows the air to circulate freely through it will keep you cool and comfortable. The Brentwood Home Oceano mattress does a great job with minimizing sinkage. However, due to its hybrid design, there is a decent amount of it, although this largely depends on the weight of the sleepers. The Oceano also has a solid edge support due to its 8-inch Quantum Edge Combi-Zone individually wrapped coils, so you won’t feel like you’re going to roll off the mattress. There is a small amount of motion transfer with this mattress when sleeping and changing positions during the night due to the foam and micro coil construction of the Oceano. The Brentwood Home Oceano gets high marks in this category for not releasing any noticeable smell upon opening the box which many foam mattresses tend to have due to their plastic packages. Its hybrid nature also contributes to minimizing the amount of off-gassing. The Oceano is the premium hybrid mattress in Brentwood Home’s mattress lineup coming in at $1495 for a Queen. This is quite a reasonable price given the quality of materials used in its construction. 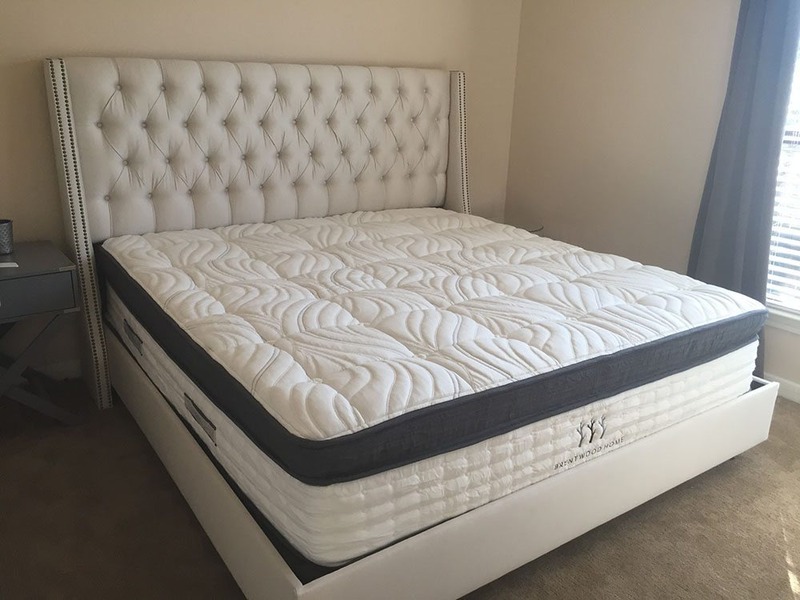 Click here to read the full Brentwood Home Oceano mattress review. Click here to buy Brentwood Home Oceano mattress. The WinkBed mattress is a 15″ thick innerspring and foam hybrid. It is made up of 6 layers of foam and springs wrapped up in a luxurious and very attractive and soft exterior. 1″ Top Comfort Layer – This layer is 1″ of 1.5lb Hypersoft foam that provides buoyancy, comfort, and contour for the body. 1″ Top Cooling and Comfort Layer – This layer is 1″ of premium 1.5lb Gel foam that provides additional comfort, cooling, and breathability. 2.5″ Foam Coil Layer – This layer is 2.5″ of foam encased innerspring micro air-spring coils. There are 1,358 coils in a Queen, designed to provide support and pressure relief and allow better airflow and cooling. Lumbar Pad Layer – Located beneath the air springs, this layer is made of pre-compressed densified cotton for lower back support. Steel Coil Support Layer – 14.15 gauge steel coil with 858 coils per queen – a total of 2,211 with the above layers for a queen which provides support and weight distribution and aids in cooling. 2″ Support Foam Layer – It is the final bottom layer of 1.5lb density support foam that acts as the foundation for the above layers and helps keep the mattress shape. The cover of the WinkBed mattress is a luxurious one, made from Tencel, a plant-based fiber that is more absorbent than cotton, softer than silk and cooler than linen. Besides this, it is OEKO-TEX Standard 100, Class 1 certified – which means it is safe enough for babies and children. The white and polka dot blue color scheme combined with the tufting adds to the elegance and stylishness of this mattress. Unlike the Brentwood Home Oceano that comes in only one firmness option, the WinkBed comes in multiple firmness options and the one we tested is the Luxury Firm. 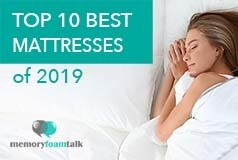 It scores 6.5 out of 10 on the firmness scale, with 10 being the firmest and feels more on the firm side when compared to the universal comfort mattresses. In terms of support, the WinkBed mattress feels very supportive with its 15″ thickness and the spring layer beneath the euro-top comfort layer. It provides excellent support to sleepers of different weights, even heavier sleepers like my partner (230lbs). 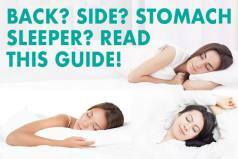 It has the necessary firmness for back and stomach sleeping while offering enough give in the top comfort layers to cradle your hips and shoulders, which makes this mattress suitable for all sleeping positions. The WinkBed mattress is very comfortable with the top layer of quilted foam and Tencel providing a supple sleeping surface, while the springs beneath do the heavy lifting. It gives you the feeling of sleeping “on top” instead of “down in” the mattress and provides a nice degree of bounce and responsiveness needed to switch positions and support heavy body weight. The WinkBed does a good job at sleeping cool due to the combination of the gel foam top layer with the micro air springs and inner steel coils in its construction. The CoolControl base option that the WinkBeds company offers aids in cooling by providing independent heating and cooling of each side of the mattress. The WinkBed, just like the Brentwood Home Oceano, does an excellent job with sinkage and motion transfer. The 15″ construction of this mattress including durable support steel springs and the micro air springs supports weight and regulates sinkage exceptionally well. Edge support is also very good with this mattress as the edges do not compress too much when sleeping or sitting near them and you will not experience the feeling of the “rolling off” the edges. The degree of motion transfer in this mattress is a little bit higher than in most of the foam mattresses we have reviewed, but it is nothing too extreme. The company delivers white-glove to your door so there is no any smell or off-gassing. The WinkBeds mattress comes directly to your door in its natural form, uncompressed, so it doesn’t release any noticeable smell typical for many Bed-In-A-Box mattresses that often come wrapped in plastic packages. Free Shipping and white glove delivery. The WinkBed is priced very reasonably given the premium materials used in its construction and white glove delivery. The WinkBed sells for $1299 for a Queen, and you can save $50 using our code MFT50. A foundation is available for $250 with the CoolControl foundation for the additional $2200. Click here to read the full WinkBed mattress review. Below is our comprehensive side-by-side comparison of the Brentwood Home Oceano vs. WinkBed mattress. Mattress with excellent support – The Brentwood Home Oceano provides enough give in the top comfort layer to support your shoulders and hips, while also having the firmness necessary for your back and stomach. This makes it ideal for all sleeping positions. Mattress with bounce – The micro coil construction and gel memory foam layers of this mattress provide a high degree of bounce and responsiveness. Cool sleeping mattress – The Brentwood Home Oceano sleeps quite cool due to the multiple layers of gel memory foam, micro coils, ventilated Airlux foam, and wool / Tencel top cover. Sharing your bed – The Oceano is a good choice if you plan on sharing your bed with a partner. The micro coil and foam construction of this mattress causes less motion transfer when sleeping and changing positions with your partner during the night. Mattresses with luxury but eco-friendly covers – The cover of the WinkBed is a luxurious one, made from Tencel, that is soft and absorbent, plant-based eco-friendly fiber. Besides this, it is OEKO-TEX Standard 100, Class 1 certified – which means it is safe enough for babies and children. Excellent support – In terms of support, the WinkBed mattress feels very supportive with its 15″ thickness and the spring layer beneath the euro-top comfort layer. Sleeping cool – Gel foam top layer helps the WinkBed sleep cool while the coil structure of it allows for increased airflow through the mattress and aids in cooling. Besides this, WinkBeds offers accessory options for temperature regulation.